Selma as an antique shopping destination background sheet. Selma is a different place than it was just ten years ago. The changes are dramatic and profound for this small town located on I-95 and US 301 in rural Johnston County. The Mayor, Town Manager and Town Council made revitalization of downtown Selma their number one priority and antique shopping was their niche market. Selma’s leaders realized that with I-95 carrying 43,000 cars pass their town daily, and being located 30 minutes from Wake County and Research Triangle Park, that the number of potential visitors, with disposable income were within their reach. With a well devised plan to offer “free rent” of retail antique space for one year to anyone who would open an antique or arts store in Selma, the plan was put into place. With well-placed newspaper stories, and advertising in antique magazine publications the prospective dealers began calling. To date, over $1.5 million has been spent by private businesses purchasing buildings and renovating them. With advertising dollars invested in billboards, radio and print campaign, the word spread and antique shoppers came. The streets are lined daily with cars from out of state and on an average Saturday, hundreds of antique shoppers will travel to Selma. Shoppers now will find over 100,000 square feet of antiques within walking distance of each other on a picturesque 1950’s street scape. Antique dealers work cooperatively to market Selma as a destination. Visitors are made to feel welcome by the dealer’s friendly and inviting nature, and they have truly united to make Selma’s plan come together. 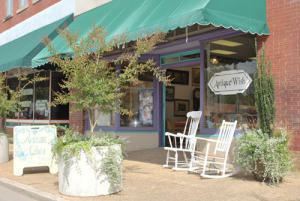 With success in one arena of retail shopping, Selma has attracted more success with new restaurants locating in downtown to feed hungry antique shoppers. After the shopping is done, and visitors have hopefully found Creech’s Drugstore and enjoyed a old-fashioned fountain lemonade, ice-cream float or milk-shake ... or lunch and dessert at The Cakery! Visitors will also find an evening of entertainment in Selma awaits. The American Music Jubilee in the renovated Rudy Theatre, offers live entertainment with country music and comedy. This variety show is a touch of Myrtle Beach and a touch of Branson in a 576-seat theatre. The show is drawing church groups, motorcoach groups and visitors from up and down the East coast. The Christmas Show is a must see for adults and children of all ages, with the show beginning in early November and running until the week of Christmas, with added dates and matinees. Last year’s dates were completely sold out with over 30,000 visitors enjoying the show. If you happen to be around Selma the 3rd weekend in June, join us for the 301 Endless Yard Sale. The sale is currently in its 5th year and takes place every third week in June in North Carolina along US Highway 301. It is organized jointly by the 5 counties along the 100+ mile route: Halifax, Nash, Wilson, Johnston, and Harnett counties. This year&apos;s sale will be June 16th and 17th, starting at 7AM every morning and going until around 5PM. Some participants are looking for deals and vendors set up in their yards to sell typical yard sale things - clothes, shoes, books, hand-me-down things, records, appliances, etc. But, there are also places along the route in the more populated areas like Benson and Selma, and further up in Nash and Halifax county, where serious antique dealers, vintage collectors, and full-time restoration vendors sell high-end pieces to people looking to upcycle the items or decorate their homes. It&apos;s a good collection. There are tons of quaint, southern restaurants along the route and locally-owned national chains. It really is this amazing yard sale mecca mixed with a southern road trip.